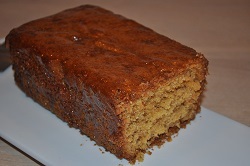 The other day I prepared this lemon-flavored plum cake, very simple and tasty. The idea of ​​preparing it has come from a proposal from Elena Meneghetti's cooking blog that I have adapted to my tastes and ingredients, even as a quantity, available at home. This is not a complex preparation and I definitely have it to the minimum terms just to have a dessert for breakfast ready on the table for a couple of days. It is a cake prepared on the fly already a couple of times and that I have not photographed the preparation, only the result ... but since it's good, I decided to publish at least recipe! For anyone who wants to try it, the recipe is here. Good breakfast or good snack! I have indicated how to use breakfast or snack, but if you want to eat it even after dinner, go quiet: it is very light!